I created this look yesterday since I had some free time so I thought why not utilize it in doing an eye makeup. I also realized that it does works as a stress buster for me most of times like shopping does for most of us. I have created a pictorial to show you how I have done that. I am not listing any eye makeup products. Let’s start. I applied an eyeshadow primer to make sure that the colors pop and give a better pigmentation. I am using the same old fellow from my faces smokey eye kit. I used a glittery dark grey color on the lid and gently pack it on the lid. Then in the step 2 I applied a shimmer berry color on the inner half of the lid. It was actually a loose pigment that i got long ago but never used it. 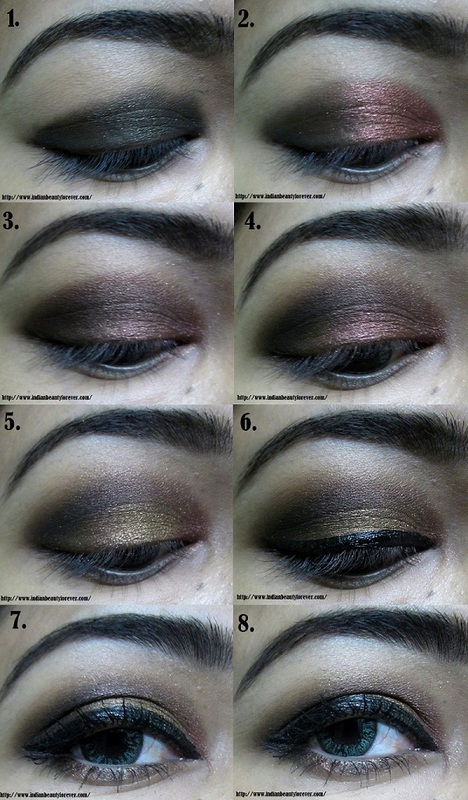 Gently blended that on the lid and applied a dark grey shade on outer V and gradually blended it towards the crease. Now, on the centre of the lid I placed a gold color and very gently smudged it. We are done with the eye shadow part. Bring the same colors underneath if you wish. Now, it’s time for the eyeliner. I have applied a liquid liner which has a medium thickness. 2 coats of mascara and we are done with the eye makeup. Don’t forgot your eye brows, shape them fill them if required. I have used Colorbar concealer, it's quiet good so far. This is the picture of both the eye and below is the FOTD. Wow, you really have stunning hair!! Oh wow!as always a fabulous job n u look superrrrr gorgeous!! Lovely ............Niesha give us some tips !!! Thank you Shruti..:) still learning dear. Do tell the lipstick shade u r wearing! glad u liked. it is Inglot 37 from freedom system. Its an orange shade actually. This is so beautiful and I love your hair! Thank you Dollie..:) Glad you liked. If there would be one wish of grants then it would be plz give my volume back. Thank you so much Dr. Neeraj. it is very encouraging and I am so glad you liked. The eye shadows from the 2nd and 3rd pics are gorgeous!